Summer Home Decor Ideas To Enhance Your Luxury Bathroom – Now that summer is almost here with all its long day hours and warm evenings, it’s time to spend more time outdoors and enjoy these good vibes. So, why not place a bathroom in your backyard? Have you ever think of it? Of course, there are several things you need to consider when choosing the right bathroom furniture considering that they will be under all the different weather conditions and subject to the elements influence. But apart from that, it’s a fact that having a long bath in an outdoor bathtub or a quick refreshment in an outdoor shower, with the warmth of the summer weather and surrounded by Nature is very tempting. It might even look like a dream! Bearing this in mind and to help you give shape to your dreams, Luxury Bathrooms selected just a few outdoor bathroom decor ideas so you can be inspired and start considering having your own outdoor luxury bathroom. Another great spot to recreate an amazing outdoor bathroom is a balcony, just like the picture above. And if you’re home is facing the beautiful blue sea, then the scenario couldn’t be more perfect. If you could have problems considering privacy issues, then a tall fence like the one picture above could be the perfect solution. And more, it gives a tropical feeling to the bathroom. Consider marble or natural stone bathtubs or other accessories to make them resistant to nature elements. Stainless steel is also a good option. With all these beautiful outdoor bathroom inspirations, I am sure that your own project will be just like a true spa at your private place. Take a look now at our suggestion of the day for your luxury bathroom and screaming summer spirit out loud. The warmth brought to your home by this lighting piece will expand all over the ambience like sunlight rays. Inspired by the sun, SOLEIL wall lamp is the element that will complete your living room design. Its harshness it’s smoothed by the brightest light projected by the hammered brass rays. 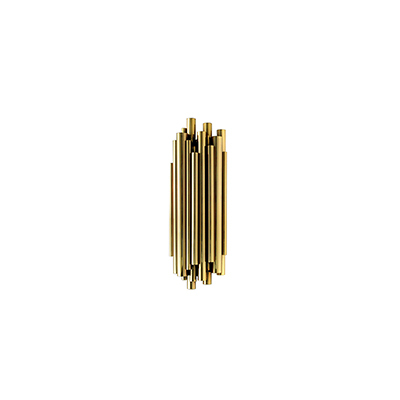 Discrete but yet remarkable SOLEIL will shine in your home space bringing you a warm ambience to your modern bathroom. Buy now! With all these amazing bathroom decor ideas, I am sure that your bathroom decoration or renovation will end up in something completely stunning. If you have suggestions or would like to say something, be free to leave a comment or send us a message. Your opinion is important to us! Meanwhile, if you are fond of using marble in your home decoration, watch the following video for some amazing Marble Design Ideas 2017.